A sleeping yellow Labrador retriever puppy amidst its chocolate lab siblings. Today, while still very, very thankful for a wondrous abundance of bug life, I am probably more thankful for very young puppies in food comas. (And isn’t that their natural state half the time?) Really, I couldn’t be more thankful for my dog, Izzy, who came into the family early this year. I didn’t have as nice of a shot of her as pot-bellied wee pup, so instead here is an old shot of her napping sister, the only yellow among chocolates, Ziggy — no doubt having just chowed down. I will try to show some virtue and not end up like the pups in the photo. To those celebrating, happy Thanksgiving! 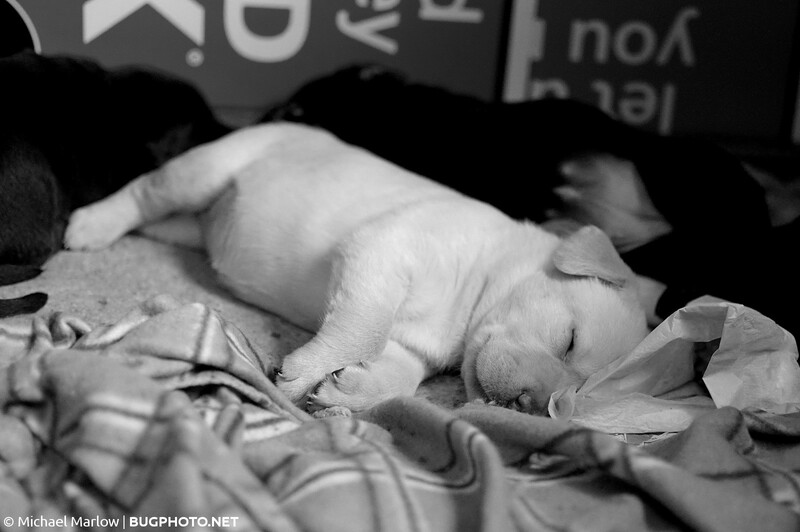 Posted in Not a BugTagged black and white, chocolate lab, dog, feed coma, labrador retriever, monochrome, nap time, puppy, sleepy, Thanksgiving, yellow labBookmark the permalink.